After a five-game losing streak, Washington lost their sixth — but still nabbed a point in overtime against the San Jose Sharks. The Sharks visited Washington on the second night of a back-to-back following a 6-2 loss to the Florida Panthers on Monday night. San Jose came out strong with captain Joe Pavelski scoring twelve seconds into the game. All was not lost, though, as Ovechkin tied it up on a nifty backhand shot ten minutes later. The call-and-response of goals continued throughout the first period, with Andre Burakovsky scoring his first goal since Dec. 6. Ovechkin nabbed another point with a primary assist on a breakaway that T.J. Oshie finished. The Caps entered the second period with a successful kill on a tripping call against Matt Niskanen, but ceded a goal to San Jose’s Evander Kane right, as the penalty expired. 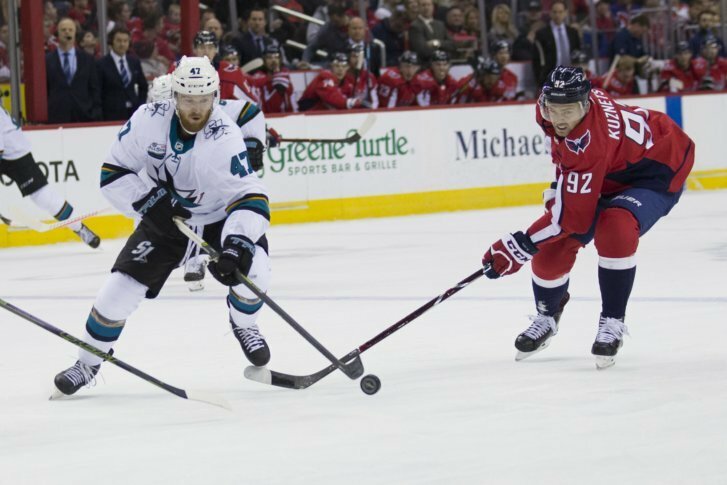 Despite an undefended three-man rush led by the Sharks that ended in a goal for Logan Couture, the Caps continued their offensive perseverance. Another goal from Ovechkin and a tally from Kuznetsov put the Caps up 5-4 at second intermission. Ovechkin finished his 23rd career hat trick in the third period. The Capitals showed improvement by holding a lead for the majority of the game, but a buzzer-beater by Evander Kane sent the game to overtime with less than a second left in regulation. San Jose’s Tomas Hertl finished his hat trick with the overtime winner to hand the Caps a narrow 7-6 loss. One thing to take away: This is the Capitals’ first time losing six straight since 2014, but if their pace of play was anything to go by against San Jose, Washington will be ready to turn it around with a win on Wednesday night. A players-only meeting on Sunday was cause for concern. But as tonight showed, it could be what the team needs to regroup. What’s next: The Caps travel to Toronto on Wednesday at 7:30pm. Pregame coverage begins at 6:30pm on NBC Sports Washington and the MyTeams app, with the game streaming nationally on NBCSN.